When you work at CoBank, you can depend on us to make a substantial investment in your development. Building on individual capabilities is how we help associates grow into larger and more complex roles that support our mission as a dependable provider of valued-added financial services. 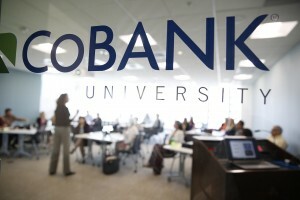 Established in 2009, CoBank University provides associates with over 500 instructor-led or online courses each year. The University features separate “colleges” focused on Associate Excellence, Credit Excellence, Leadership Excellence, and individual excellence, with structured curricula ranging in length from a few days to two years to complete. The IDP is designed to help create a road map for continued growth and opportunity. Associates meet with their managers to assess their skills, discuss their goals, explore possible career paths, and identify any training needs. Through CoBank University, we have developed a customized multi-level program designed to create successful leaders who value Human Equity and understand associate engagement. In our Leadership Excellence program, coursework focuses on the basics of supervision, performance management, emotional intelligence, coaching, team engagement, building trust, and other essential management skills. Our advanced leadership curricula provides classes on presentation skills, change management, strategic thinking, Crucial Conversations™, Crucial Accountability™, and managing engagement. We also send high-performing associates to several external leadership training events each year including the University of Missouri Graduate Institute for Cooperative Leadership, Harvard University Agribusiness Seminar, Farm Credit Council Executive Institute, and G100 Talent Consortium. Our tuition reimbursement program provides associates up to $5,250 towards undergraduate and advanced degrees annually for degrees that will help the associate advance in accordance with their IDP. All divisions within the bank have training budgets to send associates to outside training programs, seminars and conferences.